Almost all Hindu festivals are dependent on the position of the moon; however, Makara Sankranti is based on the position of the sun. The sun enters the zodiac sign of Makara (Capricorn) on the day of Makara Sankranti. All the tithis (dates) of Hindu Dharma’s festivals vary every year; however, Makara Sankranti falls mostly on 14 January (occasionally on 13th or 15th January). Every eighty years, the difference created due to the revolution of the earth around the sun is made up by pushing ahead Makara Sankranti by a day. Since time immemorial, demons have been troubling humans as well as Deities. When such situations arise, God incarnates and slays the demons. It is said that Sankranti, a Deity, slayed a demon, Sankrasur, on this day. Makara Sankranti is celebrated to let go of our differences with each other and increase love (prema bhava) in us. Spiritually, this day is very conducive for sadhana and to imbibe the Chaitanya in the environment. Sankranti is considered a Deity. According to a legend Sankranti killed a demon named Sankarasur. The day followed by Makara Sankrant is called Kinkrant or Karidin. On this day, the female deity (devi) slayed the demon Kinkarasur. In Bharat, Makara Sankranti is celebrated to let go of our differences with each other and increase love (prembhav) in us. One way people come close together on this day, is by distributing sweets to each other. These sweets are typically made of sesame seeds. a. On Makara Sankranti from sunrise to sunset, the environment is full of Chaitanya. Thus, a seeker doing sadhana (spiritual practice) can derive the maximum benefit of the increased Chaitanya. Due to the Chaitanya, tejtattva (Absolute Fire Principle) also increases in seekers. b. The day of Makara Sankranti is very conducive for sadhana. a. Before distributing sweets made out of sesame seeds, they should be kept in front of an idol or a picture of a Deity on one’s altar. This helps retain the Shakti (Divine Energy) and Chaitanya (Divine Consciousness) in the sweets. b. When distributing sweets made of sesame seeds, bhav (spiritual emotion) and Chaitanya is awakened in us. c. All the members of the house derive the benefit of the increased Chaitanya in the environment. d. The prembhav (love) in people increases and they are able to overcome negative thinking and replace it with positive thinking. e. According to Ayurveda, eating sesame seeds in winter is beneficial for our health. Spiritually, sesame seeds and sesame oil have the ability to absorb and emit Sattva frequencies more than any other oil. Hence, during Makara Sankranti, sesame seeds are favorable for good sadhana (spiritual practice) to happen. f. Importance of sesame seed sweets: Sesame seeds have the ability to absorb and emit high amounts of Sattva frequencies. By consuming sesame seed sweets, inner purification happens which helps improve one’s sadhana. By distributing these sweets to each other, there is an exchange of sattvikta, which helps increase everyone’s sattvikta. Hindu festivals are great opportunities to imbibe the increased amount of positive energy and Deities’ principle in the environment. However this is possible only if one celebrates the festivals as per the guidance of Hindu Dharma. 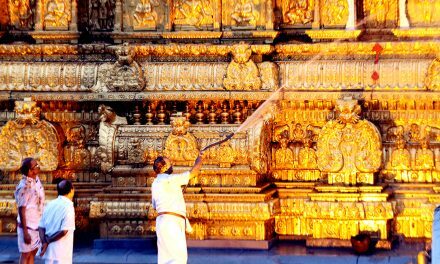 By adhering to Dharma we can derive the maximum benefit of each festival thereby purifying ourselves as well as the environment. 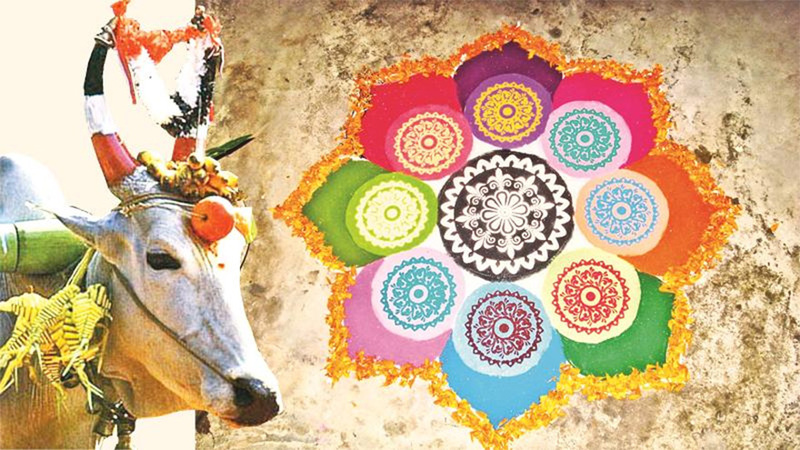 How is Makara Sankranti Celebrated? Different regions in Bharat (India) celebrate Makara Sankranti in different ways. The following are some examples of the various rituals that are performed on this day. The period from sunrise to sunset is meritorious. A Holy bath at any Holy place on the banks of the rivers Ganga, Yamuna, Krushna, Godavari, etc., on this day, yields great merits. The period from Makara Sankranti (14 January in 2014) to Rathsaptami ( 6 February in 2014) is called a Transition period (Parvakal or Sandhikal). Any offerings / donations (daan) and meritorious acts done during this period definitely yield fruit. White sesame seeds (til) are used extensively while celebrating Makara Sankranti. People prepare sweets made of sesame seeds and distribute them to others. Sesame seeds have the ability to absorb and emit high amounts of Sattva frequencies which in turn facilitate spiritual practice. 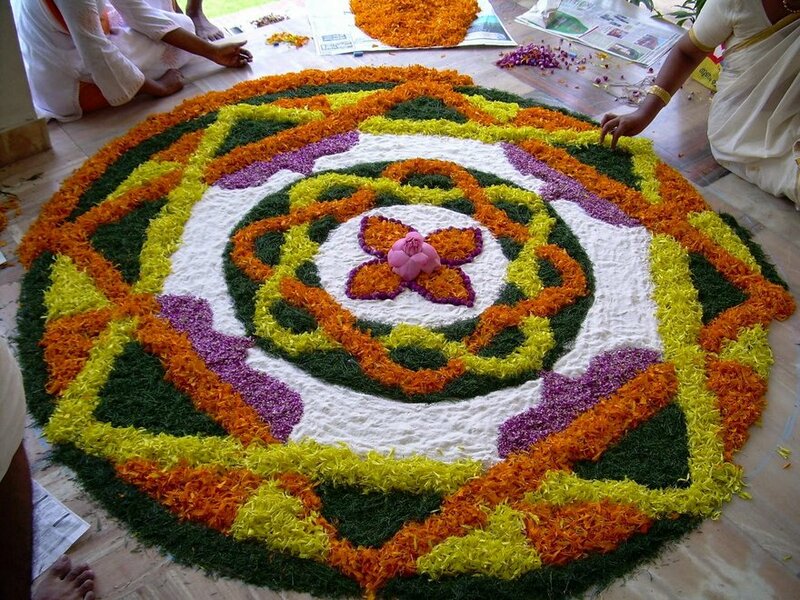 Women celebrate this day with an event known as ‘Haldi-Kumkum’ or ‘Haldi-Kunku’. They apply turmeric and kumkum (vermilion) on the forehead of other women at the site of the adnya-chakra, apply perfume (attar) to hands-forearms-feet, offer 13 types of sattvik gifts (vaan), sprinkle rose water on them, offer sweets made of sesame seeds and do the ritual of offering a sāṛī and/or a piece of cloth to a female Deity or to a married woman (Oti). 1. Benefit of highest merit acquired by a Holy dip on the day of Makara Sankranti: The time from sunrise to sunset on Makara Sankranti is auspicious. A Holy dip during this period carries special significance. Those who take a Holy dip in the rivers Ganga, Yamuna, Godavari, Krushna and Kaveri at the Holy places situated on the banks of these rivers acquire the highest merit. 2. 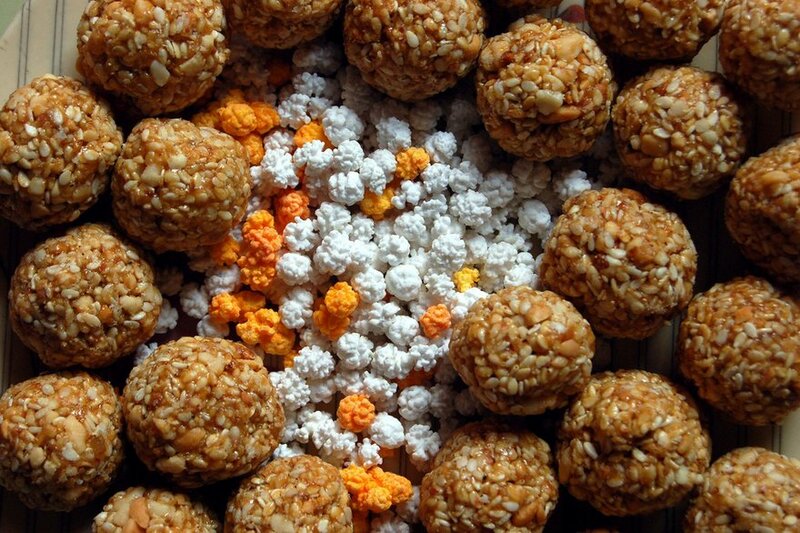 Makara Sankranti Offering: Importance of making an offering during an auspicious period: The period from Makara Sankranti to Rathsaptami is an auspicious period. Any donation and meritorious deeds in this period prove more fruitful. Substances offered on Makara Sankranti: An offering of new vessels, clothing, food, sesame seeds, pot of sesame seeds, jaggery, a cow, a horse, gold or land should be made depending on the capability. On this day, married women also make some offering. They take things from unmarried girls and give them sesame seeds and jaggery in return. Married women organise a ceremony of haldi-kumkum (applying vermilion and turmeric to the forehead) and gift articles to other married women. 3. Importance of haldi-kumkum ceremony performed by married women on Makara Sankranti : Performing haldi-kumkum(Turmeric powder and vermilion) ceremony is in a way invoking the waves of dormant Adi-shakti in the Universe to get activated. This helps in creating impression of Sagun (Materialised) devotion on the mind of an individual and enhances his bhav (Spiritual emotion) unto God. Applying haldi-kumkum to a suvasini (A married woman whose husband is alive) activates the dormant Principle of Sri Durgadevi in her and bestows well-being to the applier suvasini. Fragrant particles emitting from the perfume please the Principle of the Deity and bestow well-being to the applier suvasini within a shorter period. The fragrant waves emitted by the rose-water activate the waves of the Deity and purifies the environment, and the suvasini who sprinkles it gets greater benefit of the activated Sagun Principle of the Deity. can you provide dates of all 12 surya sankranti through out the year.makar sankranti almost comes on 14 th january some times on 13 or 15.
but sankranti all of them have some importance . there are 12 rasis so there has to be 12 sankrantis.